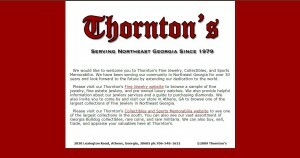 Thornton’s address, phone, website, hours of operation, and more. 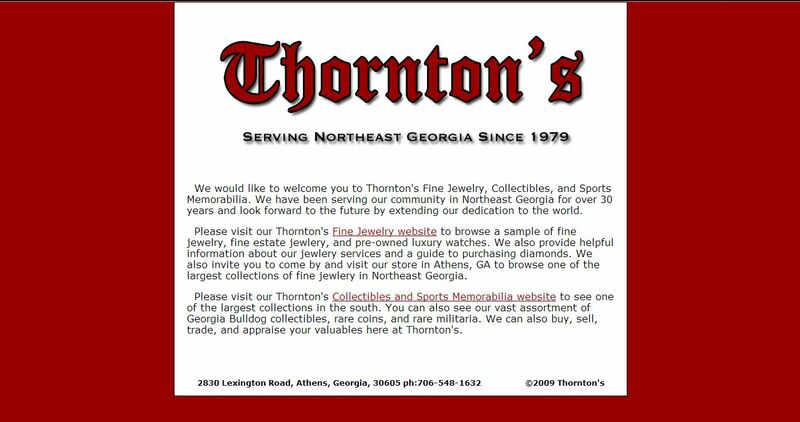 We would like to welcome you to Thornton’s Fine Jewelry, Collectibles, and Sports Memorabilia. We have been serving our community in Northeast Georgia for over 30 years and look forward to the future by extending our dedication to the world. Please visit our Thornton’s Fine Jewelry website to browse a sample of fine jewelry, fine estate jewlery, and pre-owned luxury watches. We also provide helpful information about our jewlery services and a guide to purchasing diamonds. We also invite you to come by and visit our store in Athens, GA to browse one of the largest collections of fine jewlery in Northeast Georgia. Please visit our Thornton’s Collectibles and Sports Memorabilia website to see one of the largest collections in the south. You can also see our vast assortment of Georgia Bulldog collectibles, rare coins, and rare militaria. We can also buy, sell, trade, and appraise your valuables here at Thornton’s.